There’s this wonderful line in a movie I saw the other day about the life of Pope John Paul II — John Paul the Great. This Pope grew up in Poland and lived through the Nazi invasion and the spread of Communism in his country. And — not with violence or anger but with Faith and Love — he was one of those remarkable leaders who were instrumental in the fall of Communism in Poland. The Catholic Church has begun to be persecuted for the first time in nearly 3 centuries of American freedom, and it is difficult to know how to respond to the challenges that we are starting to face. I did not know what to do, until the other night when I saw this movie. It isn’t until the end of the movie that you realize that the advice given was truly wise and good and resulted in this great man conquering evil totally and completely through God’s Love. He is still doing it today, as his words inspire countless young people to create a world of goodness and love despite the dark forces surrounding them. The advice? Meet an abyss of evil with an abyss of love; give hope to the hopeless; stand firm and speak the Truth in Love always; and especially be more Catholic and better Catholics than we have ever been before. That is the right response to the injustice and even persecution that awaits us in the near future. This Pope is an inspiration for our times and by peacefully following his example we can be a light in the darkness, no matter what challenges the future may bring. We must pray harder, love more, and be a light in the darkness in our world. I know that our beloved Pope John Paul II would approve. Here’s a trailer of that movie. And here is where you can purchase a copy. 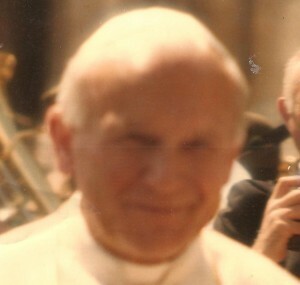 And here is the real Pope John Paul– a true inspiration and Saint for our time.